If you were watching CBS Sunday morning on September 16th, you may know this story. 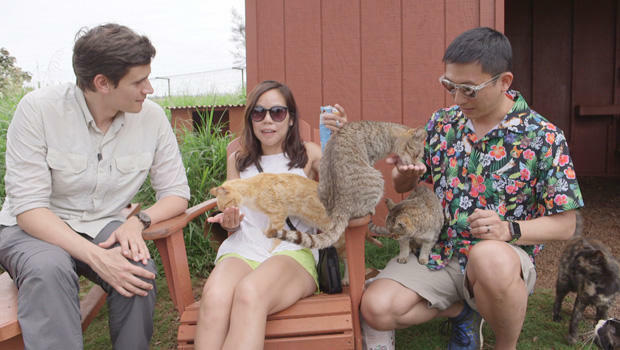 The Lanai Cat Sanctuary of Hawaii is on a mission to save feral cats and their prey. Keoni Vaughn and Kathy Carroll are doing their part to house 600 (and counting) feral cats and keep them fed. They’ve also opened up the sanctuary to visitors, who come to give the sweet faces some love. Watch the video and read the rest of the story HERE. The “We are the World” Blogfest is in its second year of a heartfelt journey. This blogfest’s goal is to spread the message of light, hope and love in today’s world. We are challenging all participants to share the positive side of humanity. This month’s co-hosts, Eric Lahti, Inderpreet Uppal, Shilpa Garg, Sylvia Stein; and Peter Nena, welcome participants and encourage all to join in during future months. #WATWB is a blog hop on the last Friday of every month. Click HERE to check out the intention and rules of the blogfest and feel free to sign up at any time. You are always welcome! Click HERE to be part of the Light. “All of the cats are available for adoption.” – We’ve now had five cats that once were available for adoption. It’s so good to see these guys being helped. Thanks for sharing this so I could start Friday on a happy note. You’re welcome, Dan! I’ve never had anything but adopted cats and wouldn’t have it any other way. It makes my heart happy that the feral cats of Hawaii are being cared for and loved. Kitty love is the best … well except maybe at 3 am, but otherwise it’s the best. I had some kitty love at 4 a.m. Poor kitty. You just want to save them all….little sweeties. Yes…busted. Save all of their sweet little purrfect faces. It irritates me when I hear or read about someone proposing to kill animals because they are labeled an, “invasive species.” I’ve heard that about Canadian geese and coyotes. The animals don’t know they’re “invasive,” they’re just trying to survive. There are always more compassionate alternative solutions. I’m happy to learn about this one. Looks like a fun place! I think humans have been the invasive species, with some not being concerned about how their actions affect other creatures or the environment. I’m glad, though, that there are people like these two who fight for the well-being of cats and anmals. Anyone taking care of animals is blessed. Those animals once stood by people, protecting households from destructive rodents and reptiles. Dogs were the best guards, raising alarms and alerting everyone in case of danger. It is terrible to see these animals homeless, especially considering that they don’t consume so much food. They could survive on leftovers, which are often discarded. When I was 12, the government sanctioned the purging of street dogs in my area. So many of them were shot dead. These days I question the madness and stupidity of such policies. Where do we want those animals to go? I feel so angry about them. Thanks for sharing the story of these great people. It’s ironic that many street dogs and feral cats are there because of humans who discard unwanted pets or don’t think to capture and neuter/spade them so their numbers don’t grow. It’s a good thing that there are people like these two in Hawaii who take care of the critters instead of killing them. All animals deserve protection – this is a lovely story thank you for sharing it! I’m a huge cat person and I love this story. Kat is amazing for what she is doing! Thanks so much for sharing this and for being a part of #WATWB. Wonderful story! I used to admire the stray felines in my old neighborhood. Many people feed them but they can’t house them because of various reasons. I would probably feed and take care of strays, but it would be cost prohibitive. It’s good there are those who have the resources and facilities to take care of the homeless fur babies.